Topchartslist.com is the PUP that uses misleading techniques to prevent removal. Use Reimage to locate malicious components and get rid of them faster than with uninstall instructions. A full system scan blocks virus reappearance and prevents traffic to malicious domains. 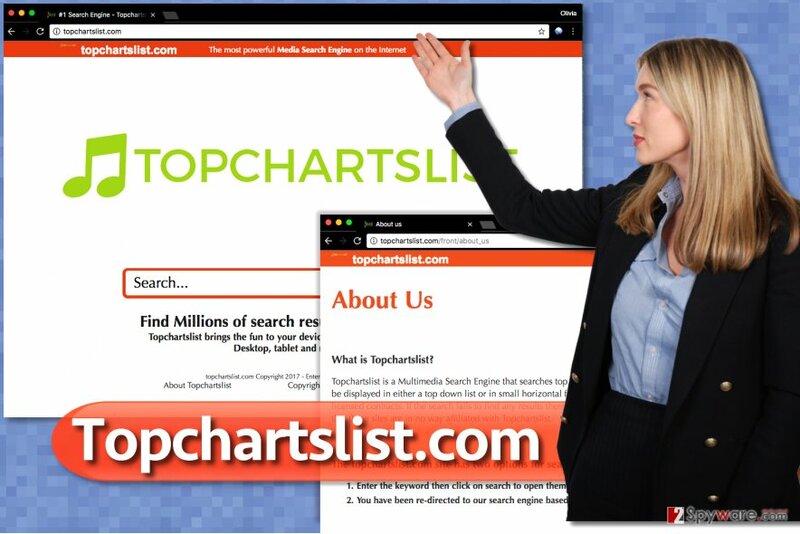 Topchartslist.com is a deceptive search tool that serves corrupt search results instead of organic ones. It praises itself to be the No.1 search engine in the world; however, that is not a grain of truth in this statement. This suspicious search engine typically sets itself as homepage and default new tab page in all web browsers installed on victim’s PC and urges the victim to search the web via it. What is even worse is that it is nearly impossible to remove Topchartslist.com without knowing that it is controlled by a browser hijacker that falls into potentially unwanted programs’ list. In other words, you have to check Control Panel and delete shady extensions from your browsers in order to get rid of it. Keeping Topchartslist redirect virus in your browser won’t do you any good. This suspicious tool slows down the computer, sometimes fails to deliver search results, triggers redirects to possibly hazardous external sites and poses a threat to your privacy because it doesn’t disclose how it collects information about the user and whether it gathers personally identifiable information or not. Besides, the site doesn’t have a security certificate, and that means your connection to it is not private (unencrypted). The website uses more or less 14 cookies to gather information about the visitor but fails to explain what kinds of data it records and for what purpose. It looks, to say at least, suspicious to us. Besides, how can you know whether such information is stored privately? Remember that it might be trying to gather personal information as well. Misusing such information can have serious consequences, so we suggest you to consider possible Topchartslist.com removal options and take care of this virtual pest right away. Our team decided to compose a comprehensive guide on how to uninstall this program manually – you can find it down below. Although such step is optional, we highly recommend you to complete the removal using automatic spyware removal tool like Reimage. 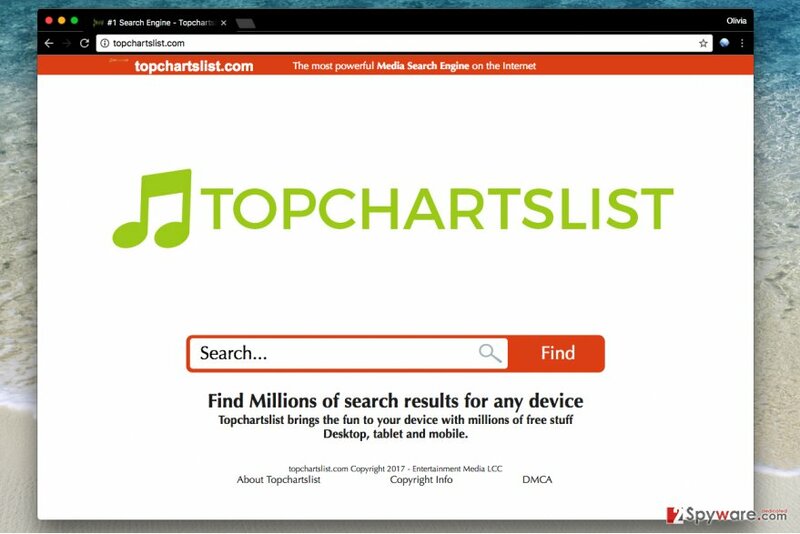 Topchartslist.com virus takes control of certain browser settings and keeps redirecting user to highly untrustworthy sites until it gets removed from the system. Users tend to rush during the installation of free software, and that leads to unexpected installation of potentially unwanted programs such as adware and browser-hijacking software. If you would like to keep such programs away from your home or work computer, never install unknown programs from various file sharing websites. Free programs need to monetize their services somehow, so they promote various ad-supported programs to get pay-per-install revenue. If you want to opt out unexpected additions and install only the software that you truly need, we suggest choosing Custom/Advanced settings in the software setup and then getting rid of check marks next to statements agreeing with the installation of promoted optional software. A quick and easy way to remove Topchartslist.com virus and all other junkware from your PC is to allow an anti-spyware software swipe them all out automatically. If you’re determined to fight with spyware on your own, you should take a look at Topchartslist.com removal guidelines presented right below the article. Please let us know if you have any questions about this browser hijacker or if you encountered some difficulties when trying to remove it. Here, look for Topchartslist.com or any other recently installed suspicious programs. Wait until you see Applications folder and look for Topchartslist.com or any other suspicious programs on it. Now right click on every of such entries and select Move to Trash. When in the new window, check Delete personal settings and select Reset again to complete Topchartslist.com removal. Once these steps are finished, Topchartslist.com should be removed from your Microsoft Edge browser. Here, select Topchartslist.com and other questionable plugins. Click Remove to delete these entries. Now you will see Reset Firefox to its default state message with Reset Firefox button. Click this button for several times and complete Topchartslist.com removal. Now that you have already deleted unwanted software, it is time to obliterate all shady extensions hiding in Chrome's Extensions' panel. Here, select Topchartslist.com and other malicious plugins and select trash icon to delete these entries. Click Reset to confirm this action and complete Topchartslist.com removal. Here, select Extensions and look for Topchartslist.com or other suspicious entries. Click on the Uninstall button to get rid each of them. Here, look at the Homepage field. If it was altered by Topchartslist.com, remove unwanted link and enter the one that you want to use for your searches. Remember to include the "http://" before typing in the address of the page. Now you will see a detailed dialog window filled with reset options. All of those options are usually checked, but you can specify which of them you want to reset. Click the Reset button to complete Topchartslist.com removal process. ^ Watch out for the latest in browser hijackers – Qtipr.com, Motious.com and Launchpage.org. eSolutions. Information about Latest Cyber Threats. ^ Eric Limer. Reminder: Your Browser Extensions Have Absurd Access To Everything You Do Online. Popular Mechanics. How Your World Works. This entry was posted on 2017-06-15 at 11:49 and is filed under Stealing programs, Viruses. You can quickly scan the QR code with your mobile device and have Topchartslist.com virus manual removal instructions right in your pocket. How did you remove Topchartslist.com virus?